Protection of people and property from natural hazards. Protection and conservation of self-sustaining ecosystems. Continuation and growth of resource-based economic activity. The underpinning premise is that resource, land use and community design decisions will be made with an eye towards their potential impact on the watershed. 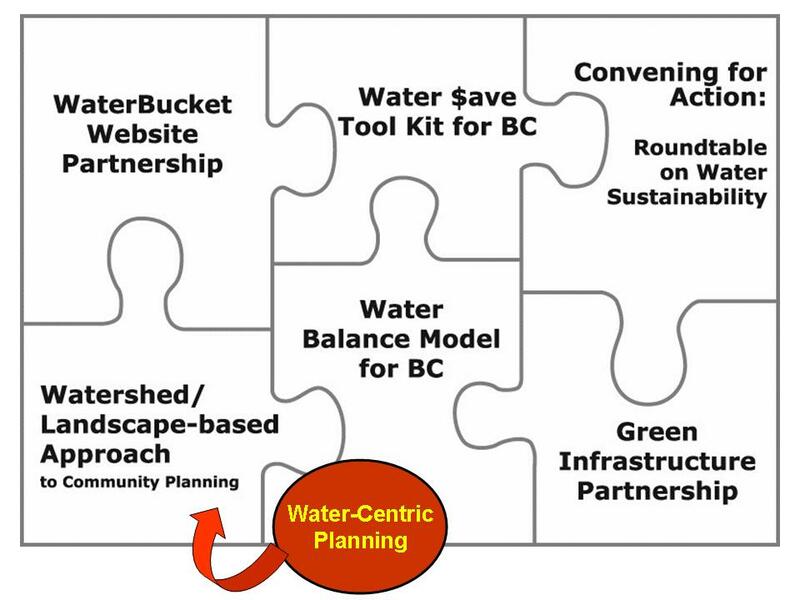 For this reason, the Watershed/Landscape-based Approach was incorporated as an element of the Water Sustainability Action Plan for British Columbia. This element has since morphed into Water-Centric Planning: by definition, this means planning with a view to water – whether for a single site or the entire province. At the core of water-centric planning is a water balance way-of-thinking and acting. 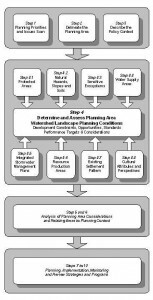 To view a graphic that illustrates the conceptual framework for the watershed/landscape-based approach, please click on this link to Levels and Scales of Watershed/Landscape-based Planning. It illustrates how analyses and assessments at the watershed level set the stage for sub-watershed level strategies that are implemented at the site level. The approach involves 3 levels of effort and 3 scales of attention. At the heart of the approach is an adaptable 10-step methodology that facilitates planning with reference to watershed-based features. 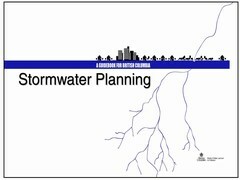 Precedent: Stormwater Planning: A Guidebook for British Columbia is a prime application of the watershed / landscape-based approach. In the Guidebook context, what happens at the scale of the individual parcel and street affects what happens at the watershed scale. 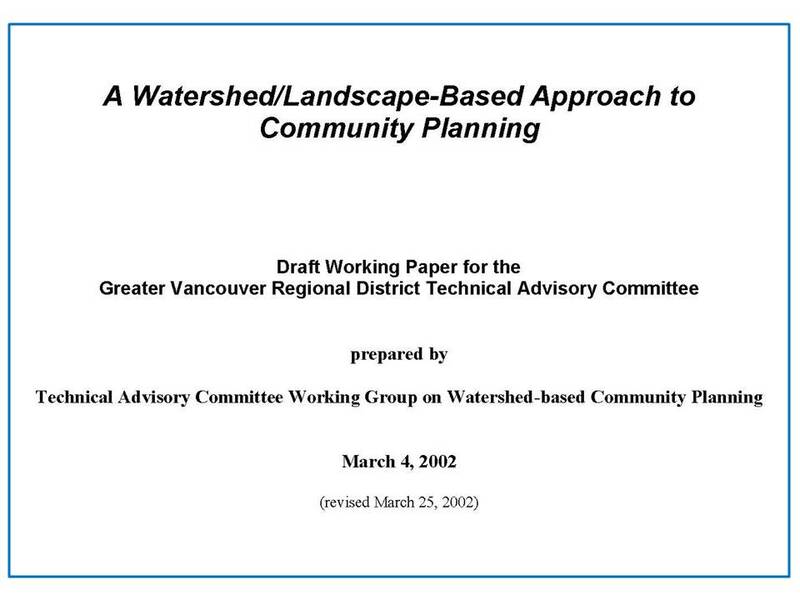 Released in 2002, the Guidebook was the catalyst that has resulted in British Columbia being recognized internationally as a leader in implementing a natural systems approach to rainwater management. The Guidebook’s premise that land development and watershed protection can be compatible represented a radical shift in thinking in 2002. This three-level/scale approach calls for the integration of information at each level before moving to the next level. Level 1 identifies conditions such as the presence and effect of physical constraints to urban development and/or environmental features and functions. Level 2involves developing a comprehensive strategy that considers effective and efficient implementation approaches. Level 3 involves implementation and performance monitoring. 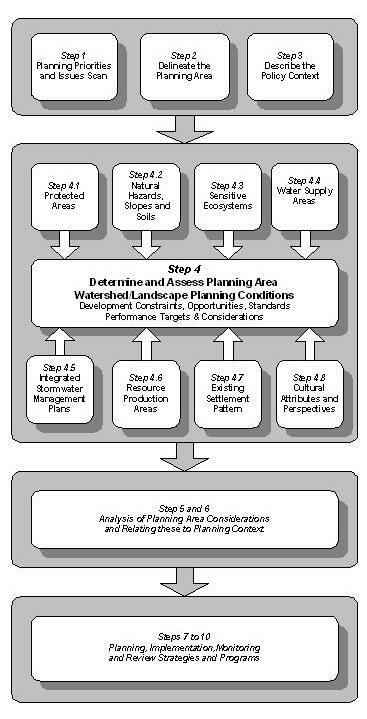 To download a PDF copy of this graphic, click on Levels and Scales of Watershed/Landscape-based Planning. 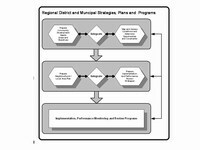 Operates within the context of existing regional and municipality-wide strategies such as the regional growth strategy and official community plans. Is informed by sector-focused strategies such as integrated rainwater management plans (i.e. the Guidebook application). Will inform the updating of existing community plans and regional strategies, as watershed/landscape-based strategies are completed. May involve inter-municipal cooperation where watersheds or drainage areas do not coincide with local government boundaries. A flooding problem that is intolerable and therefore needs to be solved. A high-value ecological resource that is threatened and therefore needs protection. If the right people with the right knowledge are involved right at the start in an interdisciplinary roundtable process, a ‘knowledge-based’ approach will be both time-efficient and cost-effective in developing ‘integrated solutions’. Principle #1:Transparent, open and engaging processes are pursued throughout each step to ensure full communication among decision makers, decision advisors, formal stakeholders, interested organizations as well as the interested and affected public. Principle #2:People who live in each community are encouraged to participate to the greatest extent possible in finding planning and management solutions that address broad through to local considerations. Principle #3:Before decisions are made, land use and development proposals and potential implementation strategies generated throughout the process are subject to multiple accounts assessments coupled with ways and means strategies. Principle #4: Intergovernmental partnerships are encouraged to address the range and complementary nature of government interests, jurisdictions, mandates and programs associated with watershed/landscape based approaches to community planning. These should involve the use of cooperation agreements to provide information, prepare plans and resolve disputes as well as implementation agreements to achieve plan results through the complementary use of government mandates. Readers will be able to readily determine what is useful and relevant, and can easily adapt the approach to local conditions. In short, the 10-step methodology is a planning tool, not a guideline or prescription. “An important message is that planning and implementation involves cooperation among all orders of government as well as the non-government and private sectors,” states Erik Karlsen, a principal author of the Waterhsed-Landscape-based Approach.